Meet the Iowa Barnstormers! 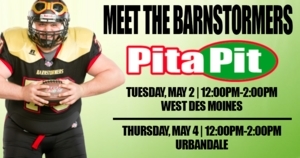 Join Barnstormers players for lunch this Tuesday, May 2 at the West Des Moines Pita Pit from 12:00pm-2:00pm and on Thursday, May 4 at the Urbandale Pita Pit from 12:00pm-2:00pm. Receive a "Buy One Get One" voucher to the Iowa Barnstormers game on Saturday, May 13 with the purchase of any pita. and enter to win an Iowa Barnstormers prize pack!